Antennal knobs are black and white. 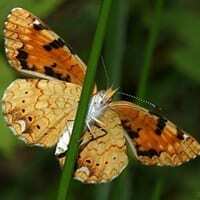 Upperside is dark brown; forewing with pale orange postmedian band and orange submarginal band. Underside of forewing is yellow; black patch on inner margin is larger than black patch near costa. Underside of hindwing is yellow-tan with faint markings; female with black submarginal dots.